i sometimes feel as though i could/should write a book entirely out of textersations between my elder sister and i.
Bahaha. Don't make out next to me. I feel the same way about donuts. In a very desperate way. I either need that or an opportunity to get in a fight. Let's fightdance. Like kevin bacon or west side story. Ooh yes. Then I could maybe burn enough calories to justify donuts...? i bet jane fonda does it. I am pretty sure Jane Fonda does a lot more than donuts ...haha have you ever seen her on an interview or anything? She is nuts! I have decided that the perfect man for you is Clark Kent. a man with a secret double life...? No not the superman part! Just the Clark Kent part. Extremely masculine yet kind. Strong, hard worker, intelligent but humble. Confident without arrogance. Willingness to look like an idiot sometimes and admire the quirks of his lady. Always the greater good in mind, but an attitude of the small things mattering. Handsome and rugged. Romantic. Loves his parents immensely. Never any desire to feel better than anyone else, always willing to give a second chance. Old fashioned manners. I could keep going, but he is perfect for you. Seriously though katie, he is one part farmer and one part journalist. I could have left it at that. I didn't realize a man could show an unacceptable amount of chest (case in point). good use of the very hip word "boss." Anyway, this made me re-laugh at our silliness. And cringe at the part where I appear to know and cherish all too much the traits of a fictional man. Also the fact that I like you so much I have decided that only Superman is good enough for you. 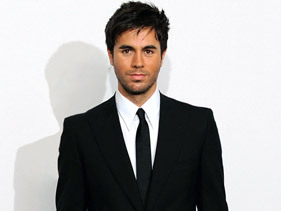 Or Enrique. Of course. I'm gonna have to agree with your sister. He's part farmer, part journalist, and ALL MAN!! Jump on it! lost without your love: 30 years! music: i just wanna run! harry, i took care of it!